If you are looking for things to do in Banff you have come to the right place! Banff National Park is full of so many different things to see and do you will likely have a harder time narrowing down your list than you will anything else. The Canmore rope swing is one of the best photo opps in Banff! It’s located in the town of Canmore just south of Banff. Getting to the swing takes just five minutes by foot, so who can say no to that?! 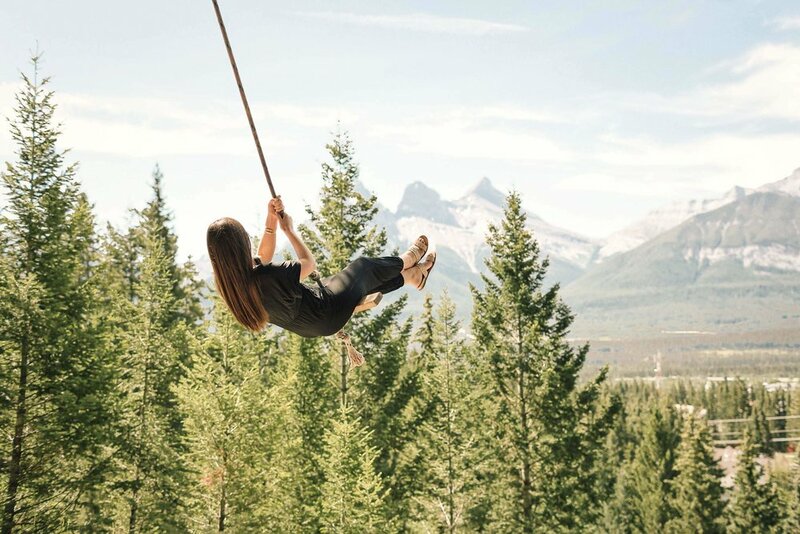 For details on how to find it and other things to know before you go, click here for how to find the Canmore rope swing. Lake Moraine is one of the most beautiful and well known lakes in Banff National Park. As someone who loves the morning golden hour, especially due to the lack of crowds in the early morning hours, I thought it would be a brilliant idea to head there as early as possible. Do note though that the parking lot has a limited capacity so it will likely be harder to go later in the day if you are there during a busy time of year. 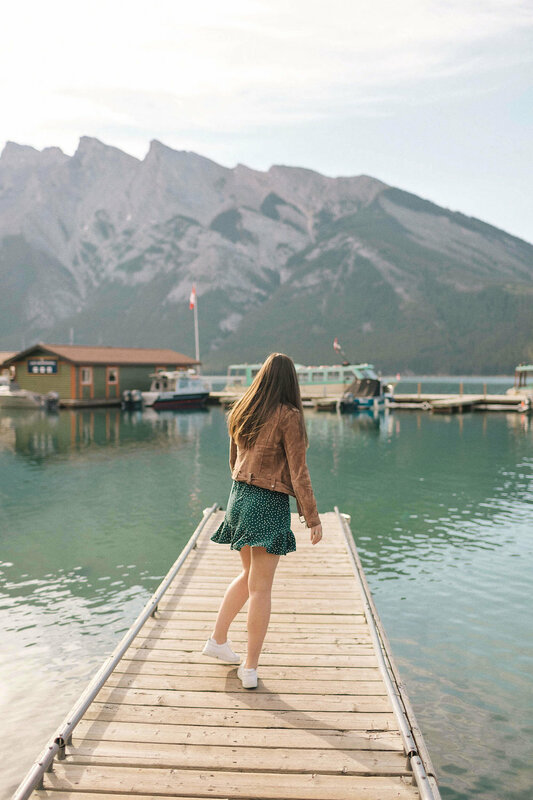 One of the best things to do in Banff and an item you certainly cannot miss while visiting - explore Banff Town! Banff is the most charming little town inside the national park. It is great to walk and shop around, photograph, grab a bite in, and more. 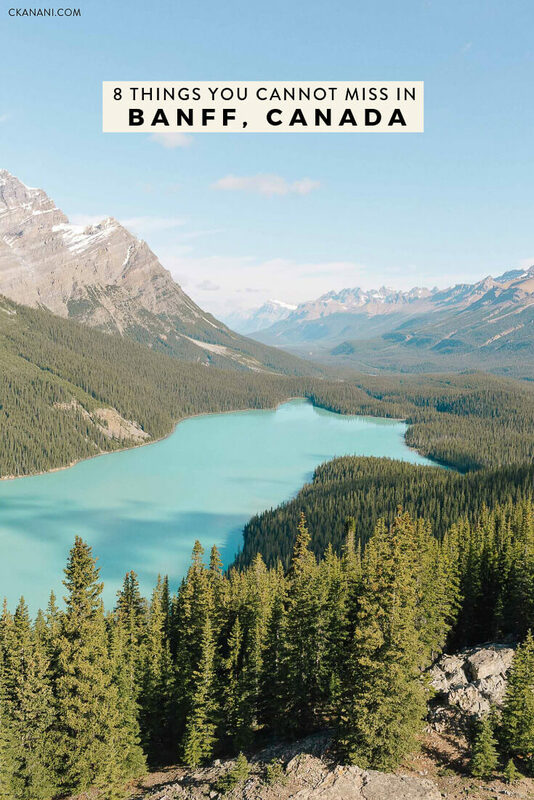 Peyto Lake is the most beautiful lake in all of Banff and visiting it is one of the best things to do in Banff Canada. With bright turquoise water and an easy to reach viewpoint, what more could you possibly ask for?! When you arrive at Peyto you will first walk to the main lookout point, Bow Summit. While Bow Summit is lovely, if you continue to walk to the left of the lookout point you will land on the much more lovely view you see above. Do that. It takes ~15 minutes, is easy (you can even do it in a dress if you want) and is very much worth the extra trek. The first time I visited Banff was July 2018. Since it was a last minute trip during peak tourist season there was almost nowhere to stay (literally - almost everything was fully sold out). I had dreamed of staying at one of the Fairmont properties in Banff so when I was invited to stay at Fairmont Banff Springs in January I of course jumped at the offer! The verdict? It turned out to be just as magical as expected, if not more. If you are wondering where to stay in Banff - the Fairmont Banff Springs is it! It is one of the best hotels in Banff and my personal favorite. First of all, it is a literal castle. They call it the “Castle in the Rockies”. It is historic and picturesque beyond words. My jaw dropped as we pulled up. Second, the dining options are fantastic. I ate in four - yes four - different restaurants of theirs and can honestly recommend each and every one of them. My first stop was their Vermillion Room for breakfast, the beautifully decorated restaurant you see above. On mornings where I needed to be up and at ‘em quickly my go to was STOCK Food & Drink, full of delicious food and drink focused on fostering relationships with local farmers. Their wine bar, Grapes, was the perfect place with a late afternoon charcuterie board and wine snack. And last but certainly not least, Waldhaus restaurant serving Bavarian cuisine. Despite being Bavarian I don’t normally love their food (don’t tell my relatives, please!) but Waldhaus was a different story. It was the best meal of my trip. Another plus, if you do want to dine elsewhere, the hotel is very centrally located so you can quickly get to the center of town as needed. Fairmont Banff Springs is also home to a marvelous spa with 23 treatment rooms, 3 waterfall whirlpools, and even an outdoor whirlpool! It is the perfect spot to relax after a long day hiking in the sun or skiing in the cold. Click here for more information, to check availability, and to book your stay! Side note: if by chance you are not able to stay here, it is still worth a visit to the spa and/or to dine at. Prior to arriving in Banff last summer, I had never even heard someone mention Two Jack Lake. Thankfully a photographer friend of mine was following along with my Instagram stories and mentioned how awesome it is. I noticed it was on the way to Lake Minnewanka, another lake I had planned to visit, so it seemed like a no brainer. To my surprise, Two Jack ended up being one of my favorite lakes in Banff! It’s not insanely popular like many of the others so it can be easier to find a spot in the lot (there isn’t a ton of parking but it’s not unreasonable) which is a huge plus if you go in July. There are some picnic tables so it’s a great place to have a picnic and there’s even room to layout if you want to get some sun! We also headed back there on a few mornings with our coffee to just sit and enjoy the morning silence. 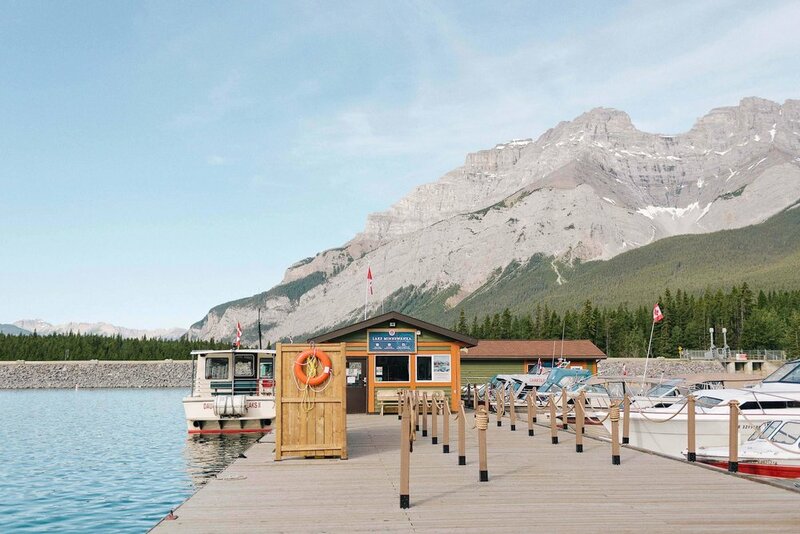 Lake Minnewanka is located on the same road just a few minutes away and is worth a stop as well. If you have been here before then you likely know that I am always on the hunt for healthy bites while on the road. After eating out for numerous days I often feel unwell so I always aim to find a healthy cafe or grocery store that I can visit as many times as I need. In Banff (well, Canmore) this was Communitea Cafe. Communitea Cafe aims to keep Canmore fresh, healthy, and vibrant by using as many local and organic ingredients as possible. While staying in Canmore during my first trip to Banff I visited Communitea countless times - for breakfast and also for lunch. I highly recommend this spot for all of my fellow health nuts! Click here for more information on Communitea Cafe. People wondering what to do in Banff often end up hoping to kayak on Lake Louise. While I love Lake Louise, at least during the wintertime, I found it to be a little too crazy during the summer. What I did not find to be too crazy was beautiful Emerald Lake! 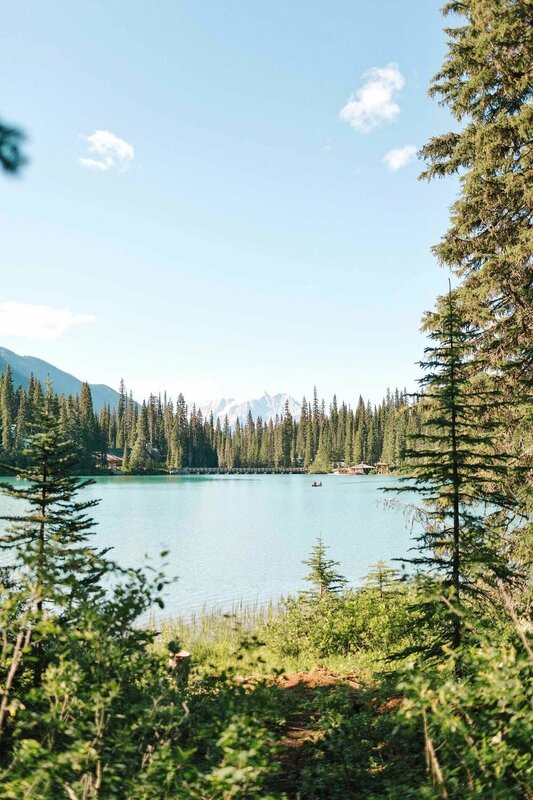 Located around 40 minutes from Lake Louise, Emerald Lake is actually part of the Yoho National Park in British Columbia. It is the most beautiful color, changing depending on which angle you view it from. At sunrise the water seems to hit just right, plus the crowds are generally less then, making it the perfect time to visit! Like this pin? Please save it on Pinterest!